Important: The flight Lima - Cusco is scheduled for 09:00 hrs. The value of the package may vary if you want to schedule the flight after this time. Important - Hotel booking is subject to space availability. 5***** Hotel Libertador Lago Titikaka(according to availability of room). At the return to Cusco we can be dropped off near to main Square or at The Dance and Music Show to watch tipical dances of Cusco. (Photo: Plaza of Cusco's Weapon in the night). TOUR TO MACHUPICCHU From 05:45 hrs to 06:00 hrs., we pick you up from your Hotel in Cusco (3400 mosl) and drive you to the Train Station, located in Poroy, then we get aboard the train and the trip from Cusco starts heading to Aguas Calientes (2000 mosl).Our Guide Will be waiting there , he will lead us to the bus station, to go up by a zigzag way for 30 minutes to reach the world wide marvel The Sanctuary of Machupicchu, known as the lost city of the Incas. 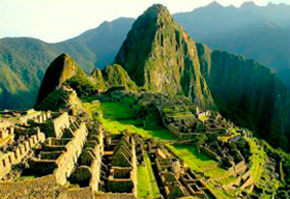 Once we get to Machu-Picchu, We'll pass throught the control, where we'll hand in our entrance tickets and where our guided tour will start, visiting the main square, the Circular tower, the sacred solar watch, the royal rooms, the temple of the three windows and the cementeries, it lasts around two hours. Afterwards you'll be given enough time to have a walk around the citadel and have your meals, at any restaurant in Aguas Calientes or if you wish at Santuary Lodge (this is not included). In the afternoon, between 15:30 hrs and 17:00 hrs we'll return on train to Cusco, we'll be waiting for you at the train station and then we'll drive you back to your hotel. 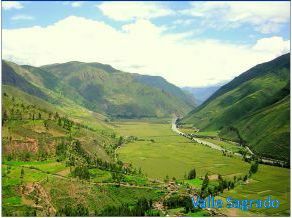 TOUR TO THE SACRED VALLEY This tour starts around 09:00 hrs., we pick you up from your Hotel, we have a guided tour to the Sacred Valley of the Incas, over the Vilcanota river, with a panoramic view of Pisac an old Inca City and a visit to the Inka market in this village, where we will have the chance to know in a closer way its people customs and get good bargains with the handycrafts and souvenirs sellers, afterwards we'll head for Urubamba, traveling on the borders of the river Vilcanota. TOURIST TRIP FROM CUSCO TO PUNO, VISITING RAQCHI After having a good breakfast, we'll pick you up from your hotel and we will take you to the bus station to start with the tour to Puno (8 hours) you will have 4 guided visits to the places of tourist interest :Andahuaylillas's temple or Sixtine Chapel of America, the Inka temple of Raqchi,La Raya to 4335 masl and the museum Inka Aymara of Pukara. 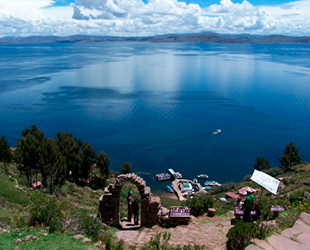 Every visit has a duration from 20 to 40 minutes, we will have a Buffet lunch in Sicuani (included).the passenger will be able to make questions, take photos and walk a while When you arrive to Puno, our personal will be waiting for you and they will take you to the hotel where you will stay. 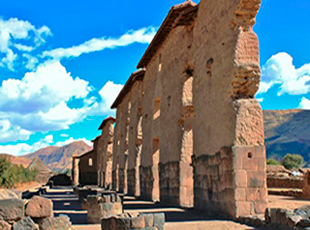 (Photo: Raqchi). CHULLPAS OF SILLUSTANI AND FLIGHT JULIACA TO LIMA After Having breakfast and once we're ready we will head to Juliaca's Airport ( 1hr from Puno) ,but on the way to the Airport we will visit the Chullpas of Sillustani for around 30 minutes.The archaeological site of Sillustani is located 22.3 miles away from the city of Puno (34 Km., 35 minutes drive) and at an altitude of 12,858 feet (3,840mts.) above sea level. 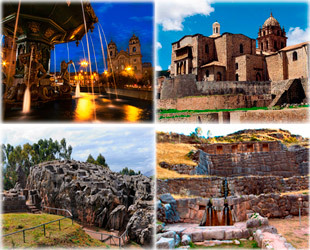 This visit allows visitors to enjoy stunning highland landscapes and imposing pre-Inca architecture. The site is strategically positioned on the top of a peninsula surrounded by a beautiful lagoon called Umayo lagoon. After all this we will get to Juliaca's Aiprot , we will display our IDs and get checked in , then we will fly to Lima as our adventure ends.